Amelia Barrett made her best friend a dying promise: to take care of her child, Lucy, at all costs….and Amelia plans on fulfilling that promise. Lucy’s father has been away at sea and has never met the child but he is returning from his adventures soon and will meet her for the first time. Amelia is fearful that he will take the child and she will never see her again. Lucy has become like her own daughter and she can’t stand the thought of never seeing her again. So Amelia has devised a plan to keep her and Lucy together forever….her can Captain Sterling will need to get married. 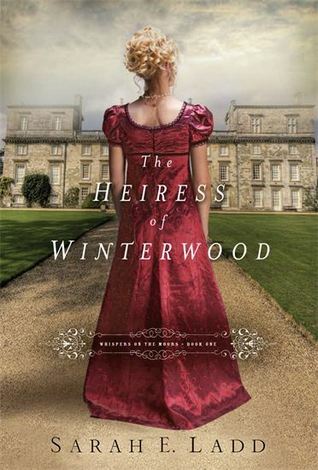 There is a slight problem however, Amelia is set to marry another man who is to become part of her uncle’s business and ultimately the lord of Winterwood. While she expected a loveless marriage, Edward Littleton, has expressed a romantic interest in her. But he has forbidden Lucy to stay with them once they are married. If she is to move forward with her plan to marry Captain Sterling, she will be going against the wishes of her family and possibly breaking Edward’s heart for good. But it’s a risk she is willing to take…..Lucy is worth it. What Amelia doesn’t anticipate is that her plan might effect more than just her and there are others who would stop it nothing to see her marry Edward Littleton instead of Captain Sterling. This was a charming romantic read. The plot sounded unique and I love the setting on the moors. I have not read anything by Sarah Ladd before, nor have I read a lot of Christian Fiction, but I’ve had my eye on this one for quite some time. The obvious first thing to stand out about the book is the stunning cover. I’m positively in love with it! But what really caught my eye about the story was the unique plot…..a woman plans on marry her best friend’s widow to keep a family for the child…..that’s definitely a different take on romance. I enjoyed Amelia as a heroine….she was loyal, strong, confident, and tenacious. Though pride was her greatest character flaw, it was annoying or frustrating at all. Sometimes when a lead character is overly prideful, it can put me off a little but Ladd did a marvelous job at making Amelia the perfect mixture of prideful and yet humble. The romance between Captain Sterling and Amelia was a little wanting for me. While it was tender and sweet, I wanted more tension between the two. I thought the circumstances of the story made it difficult for them to really develop a romance….however I thought in the beginning there could have been a lot more tension between the two. Since this is a Christian novel, the romance is obviously going to be ‘clean’ but I think it could still be a clean novel with a little more romance and tension between the characters. There were some bits of the novel that I questioned their relevance…..one being Captain Sterling’s injury. I don’t know that it added a lot to the romance or the overall story. Same with his mentor…..I guess they could both show the development of faith in his character but I thought his faith could have been tested in other ways that had more to do with the overall story. Or maybe introduce those issues early on in the novel instead of toward the end. For me they just didn’t work as well as I would have liked. There were parts of the novel which read a little more slowly than I would have liked. The pace started out with promise but then fizzled out a bit toward the middle, but picked up later on. The other thing that made me sad was the lack of setting. The title of the series ‘Whispers on the Moors’ implies that the windy, wild landscapes will play a large part in the story. There wasn’t a lot of focus on the setting besides the casual reference to the forest etc. I wanted more of the moors. All that said I still thought it was a nice, easy read and it filled the need I had to read a historic romance. I was hoping for a little more in the story but overall it wasn’t a bad read. I also have the next book in the series to read (which I plan on) so that tells me that I liked it enough to want to read more books by her!